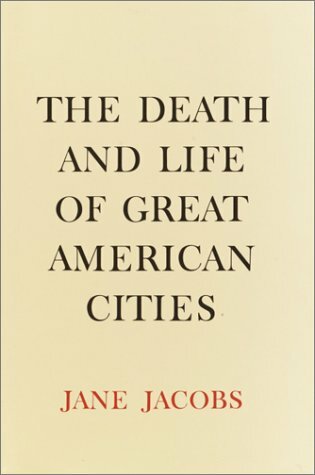 Published in 1961 and maybe more relevant today than ever before, The Death and Life of Great American Cities seeks to answer the question as to how to stop our cities from dying. Not a scholar, a planner, a scientist, or an engineer, Jane Jacobs, the author, is a city-dweller. She lives, eats and breathes the downtown, moving from New York City to Toronto, Jacobs provides insight to the successful building and maintenance of a city. Jacob’s book is divided into four sections, the peculiar nature of cities, the conditions for city diversity, the forces of decline and regeneration, and different tactics. Each of these sections is divided into four sections as well, as discussed below. The Chinese, Koreans, and Japanese associate the number 4 with death. By design or coincidence the theme of death runs true throughout Jacob’s tale. The book begins with a focus on the peculiar nature of cities, its sidewalks, its parks, its neighbourhoods and how they all tie together. How a city uses the first three determines how successful the city will be. Sidewalks are the focus of this section and are considered the life of cities; it is where society intermingles, creates safety and assimilates children. Much like veins and arteries the sidewalks, not the roads, feed the city and remove waste. Parks are much like sidewalks, a place to make contact with people and a place for children. Make the park too big or leave it unsupervised and no longer is it safe. Lacking safety children are encouraged to play elsewhere and everyone avoids the park, thus making it a desolate waste of space. The final factor affecting the nature of cities are neighbourhoods, which again should be broken down into four sections, Jacob’s three, city, district and street, but also the block. As one moves from the small block to the massive city the sense of neighbourhood, and community, is lost. Jacob’s states that districts are successful when they represent the streets, but she fails to see that first the streets should collectively work together to represent the blocks. A city is much like the interconnectedness of technology, society, ecology, and the biosphere. Our cities too are like concentric circles, centred upon homes. It is the success of the sidewalks and streets that build districts and healthy districts that respect one and other that build strong, connected cities. In the end much like the biosphere, the success is of a city is built upon respect and preservation. The third section of Jacob’s book discusses the forces of decline and regeneration. Jacob’s again uses the theme of four to discuss decline and regeneration including; successful diversity as a self-destructive factor, deadening influence of massive single elements in cities, population instability as on obstacle to diversity growth and the effects of public and private money. Jacob’s states that these factor contribute the degeneration of cities. Only by intervening can we control and eliminate degeneration. However, the first two factors are out of a city’s control as discussed below in the final section on attrition to certain neighbourhoods, both for individuals and businesses. Jacob’s neglects that cities and societies are still very hierarchical contributing to the divisions of our neighbourhoods. Traditionally society had the Kings and Queens at the top, followed by the nobles, the elite, and then the peasants. It is still much the same in a city, the elite, the bourgeois, the middle-class, and the poor or peasants at the bottom. Our neighbourhoods tend to follow this trend too. Jacob’s argues that the slums would be improved if people who crested to the middle-class level would stay in the slum. But has Jacob’s ever lived in an American slum? Individual do not wish to stay in the slums, they are unsanitary and often limit the future for the individual. Jacob’s does not comment on how deplorable these living conditions really are and how absurd it is to ask an individual to continue living in the slum. The last factor of this section, the most critical, is the debate between public and private money. Only when in complete desperation are neighbourhoods changed. Jacob’s states that neighbourhoods only change cataclysmically once recognized they are in no state for humans to live. The change comes from three forms of monies, credit extended by traditional institutions, non-government lending institutions, and money provided by government through tax receipts or borrowing power poured in at one moment. Jacob’s argues a Keynesian view that with consistent inputs of small amounts of monies neighbourhoods would be more successful at maintaining themselves. Unfortunately what Jacob’s fails to mention is the reason that governments do not continuously provide money is that governments never act proactively. From the 1950’s to today governments have never seen the bigger picture, they only act when the state of affairs is no longer functioning. Jacob’s concludes her book with hope for cities; her final section is about different tactics for successful city performance. In continuing with the theme of four the factors for city success are the attrition of automobiles, improvement of visual order without sacrificing diversity, redesigning governing and planning districts, and the two that should be combined into one section, subsidized dwellings and salvaging projects. Jacob’s most influential factor here is the attrition of automobiles. As Jacob’s writes automobiles erode cities. Instead of cars at the top of the hierarchy in planning, we need to put pedestrian’s at the top. Jacob’s disagrees with formal planning but here it is needed not only for the safety of pedestrians but also to discourage city erosion by the automobile. Also contributing to a successful city, ahead of automobiles in the trip generation hierarchy model is public transit, which Jacob’s fails to mention. By improving the visual order of cities Jacob’s actually puts pedestrian’s at the top of the hierarchy in planning. Jacob’s states that visual distractions and changing streets actually make cities safer. Think of London, UK with its sprawling streets, mixed uses and many visual distractions it is one of the safest cities to walk in; it never seems to sleep, always bustling with people. The final two sections are about redesigning the plans for districts and salvaging failing districts. Left to its own devices a city is much like Adam Smith’s theory of Capitalism. Jacob’s favours the invisible hand in planning communities believing that government intervention is usually more detrimental than beneficial. But really it is more about Keynesian theory and having some intervention from government. Politics divided these neighbourhoods, but it will be the government agencies that give back to help salvage the crumbling neighbourhoods and sew the districts together creating success in the city. The most important quarter of the book is the second section discussing a solution to creating conditions for a successful city. The heart of the solution, the central myth, is diversity or cultural unity. A central myth is how humans interpolate and extrapolate everything they see around them and how they get direction or how we learn from what we have already done. To generate diversity, to support the central myth, a city must provide the need for, primary mixed uses, small blocks, aged buildings, and concentration. Jacob’s highlights in this section that it is not just about the future and technology, a city thrives because of culture. North America went through a period of industrialization following the Second World War. This meant that people diverged. Suburbs began to peak up in large cities, new jobs were created and the focus of life changed. No longer was North America a country of farming, more people moved to the city, formal education became important and the women’s movement began. This disintegrated the culture-based connectedness as the technology-based connectedness began to flourish. But the culture-based connectedness didn’t disappear from the cities it went through a revolution. Culture was about your neighbours and friends, about living in a restored building, being surrounded by good food and a variety of stores; it was about creating a community. What Jacob’s has outlined here is the ingredients to a healthy city. She fails to site that as much as we allow a city to take on a force of it’s own that it is natural for people to flock to their ‘own.’ This also explains why cities cannot control the lack of diversity and the attrition of individuals and businesses in certain districts. Typically when an industry is flourishing in one section of a city, more of this industry will follow. It is only natural that the new business will seek a share of an existing building. Although Jacob’s says this is regulated by the Market, communities do not follow the same way. Unfortunately affluence typically follows affluence, which tends to continue in perpetuity. Jacob’s argues that affluence should move, but it seems that in any great North American city the affluent neighbourhoods are still the same. And although Jacob’s states that to improve less fortunate neighbourhoods we need to move affluence into them, this is just not possible. The individual that has just found new wealth will move to an improved area. Humans are by nature materialistic, we measure success not only by what we can afford to consume but also where we choose to live. The most successful example a city providing diversity is Toronto. Greatly influenced by Jacob’s since 1968 when she moved here, Toronto’s downtown continues to thrive despite the chokehold from its surrounding suburbs. The downtown flourishes with multi-culturism, mixed uses including restaurants, art galleries, stores and many others, buildings old, new and restored and a healthy transit system that allows the city to stay concentrated. Jacob’s discounts organized planning. She attacks planners for only seeing a city as a science. Much like a student learns about Newtonian physics in a ‘vacuum’ life does not happen in a vacuum. Cities are not vacuums they are influenced by people, culture, economics, and politics; therefore one cannot plan a successful city by putting into a vacuum. The goal of The Death and Life of Great American Cities was to get planners and the reader to think ‘outside of the box.’ To think ‘outside of the box’ a team consisting of a variety of experts from different fields is needed. Collectively if we all have a better understanding of the city and its problems and by adjusting the decision making process we can solve the problems of our cities. Although Jacobs published her book in 1961 it is more relevant today than ever before. Our cities are dying. They are aged, evidenced by the crumbling infrastructure, and they are sick, full of pollution and waste. Collectively as a society we must clean up and rebuild our cities, making them viable places to live. Despite the shortcomings The Death and Life of Great American Cities has provided the recipe to the start of city regeneration; add to that the new knowledge we have acquired through technology and culture and the seeds are there to grow successful cities.